Hummingbirds are delightful little creatures to observe in your backyard garden. Their colorful feathers are brightly iridescent including all shades of green, purple and red. There are over 300 distinct species of hummingbirds. Most are widespread throughout North, Central and South America. The smallest is the Bee Hummingbird which is about 2 inches in length and native to Cuba. 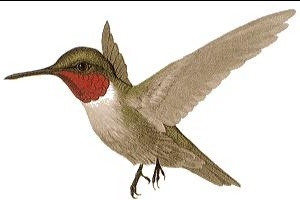 The largest member of the hummingbird family is the Giant Hummingbird, measuring about 8.5 inches long and is found primarily in the higher altitudes of South America and Argentina. You will rarely see the hummingbird at rest. They are always on the go, flapping their wings a leisurely 60 to 80 times per second while cruising for food. Hummingbirds are also known for their fantastic aerial maneuvers. They are able to fly in any direction - up, down, side to side and even upside down. An interesting fact is that baby hummingbirds can not fly and will remain in their nests until fully grown. The hummingbird's diet consists mainly of nectar from flowers, but they will also consume small insects and spiders. If you are interested in attracting hummingbirds to your garden, you should provide a friendly environment for them which includes lots of flowers as well as shelter such as large shrubs or trees where they can rest during the day and sleep at night. Hummingbirds are particularly fond of red flowers and will make regular visits to your garden if some of their favorite food sources are available. Some preferred shrubs and flowers are butterfly bush, honeysuckle, cypress vine, indian paintbrush, lantana, texas sage, bottle brush, fuchsia, colombine, lobelia, cardinal flower, hollyhock, morning glory, coral bells and many more. In addition to flowering plants, they will also take food from a hummingbird feeder. Feeders are available in a variety of sizes and shapes. They are filled with a mixture of sucrose (a form of sugar) and water. You can prepare your own hummingbird food using a formula of 4 parts regular water to 1 part table sugar which should be brought to a boil. After that, it can be stored in the refrigerator where it will keep well for a week to ten days. These mixtures are a good substitute for flowers and the hummingbirds will soon learn to return to feed on a daily basis. Male hummingbirds are territorial creatures and will fend off any others around a good feeding site. Females will also display aggressive behaviour when sitting on a nest or raising young. If you have birds that fight with others, get several feeders and place them so they are out of view of each other.